Greek cuisine is a Mediterranean cuisine. It has some common characteristics with the traditional cuisines of Italy, and the Balkans. Contemporary Greek cookery makes wide use of vegetables, olive oil, grains, fish, wine, and meat (white and red, including lamb, poultry, rabbit and pork). Other important ingredients include olives, cheese, eggplant (aubergine), zucchini (courgette), lemon juice, vegetables, herbs, bread and yoghurt. The most commonly used grain is wheat; barley is also used. Common dessert ingredients include nuts, honey, fruits, and filo pastry. 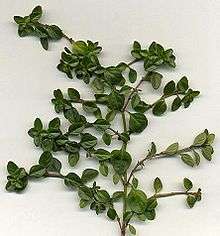 Thyme, one of the most traditional Greek herbs, was mentioned in the Odyssey. Meze or orektiko (appetizer; plural mezedes/orektika) is served in restaurants called mezedopoleía, served to complement drinks, and in similar establishments known as tsipourádika or ouzerí (a type of café that serves drinks such as ouzo or tsipouro). A tavérna (tavern) or estiatório (restaurant) also offers a meze as an orektikó (appetiser). Many restaurants offer their house pikilía (variety) a platter with a smorgasbord of various mezedes that can be served immediately to customers looking for a quick or light meal. Hosts commonly serve mezedes to their guests at informal or impromptu get-togethers as they are easy to prepare on short notice. Krasomezédhes (literally "wine-meze") are mezedes that go well with wine; ouzomezédhes are mezedes that go with ouzo. Deep-fried vegetables "tiganita" (courgettes/zucchini, aubergines, peppers, or mushrooms). 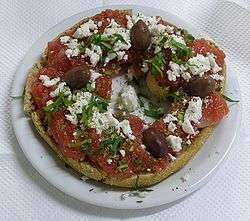 Dakos, a Cretan salad consisting of a slice of soaked dried bread or barley rusk (paximadi) topped with chopped tomatoes and crumbled feta or mizithra cheese. 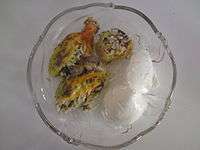 Dolmadakia ( dolma): grapevine leaves stuffed with rice and vegetables; meat is also often included. Fava: purée of yellow split peas or beans; sometimes made of fava beans (called κουκιά in Greek). In Santorini made from yellow lentils. Garides Saganaki: shrimp in spicy tomato sauce with feta cheese. 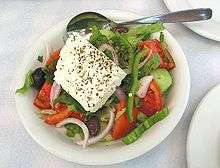 Greek salad: the so-called Greek salad is known in Greece as village/country salad (horiatiki) and is essentially a tomato salad with cucumber, red onion, feta cheese, and kalamata olives, dressed with olive oil. In Cyprus it contains also cracked wheat (bulgur), spring onions instead of red onions, and lemon juice. Horta: wild or cultivated greens, steamed or blanched and made into salad, simply dressed with lemon juice and olive oil. They can be eaten as a light meal with potatoes (especially during Lent, in lieu of fish or meat). Kolokythoanthoi: zucchini flowers stuffed with rice or cheese and herbs. Lachanosalata: cabbage salad. Very finely shredded cabbage with salt, olive oil, lemon juice/vinegar dressing. Often combined with finely shredded carrot. Marides tiganites: deep-fried whitebait, usually served with lemon wedges. Melitzanes, eggplants. Notable is the white eggplant from Santorini. Melitzanosalata: eggplant (aubergine) based dip. Pantzarosalata: beetroot salad with olive oil and vinegar. Patatosalata: potato salad with olive oil, finely sliced onions, mayonnaise, lemon juice or vinegar. Saganaki: fried yellow cheese, usually graviera cheese; the word "saganaki" means a small cooking pan, is used to say "fried" and can be applied to many other foods. Skordalia: thick garlic and potato puree, usually accompanies deep fried fish/cod (bakaliaros skordalia, i.e. fried battered cod with garlic dip, a very popular dish). Spanakopita: spinach, feta (sometimes in combination with ricotta cheese), onions or scallions, egg and seasoning wrapped in phyllo pastry in a form of a pie. Taramosalata: fish roe mixed with boiled potatoes or moistened breadcrumbs, olive oil and lemon juice. 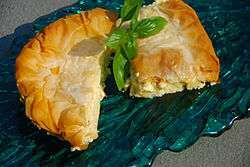 Tyropita: a white cheese (usually feta) pie with phyllo pastry. 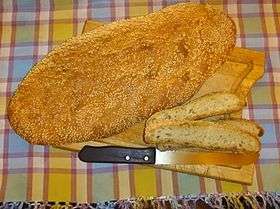 When yellow cheese (usually kasseri) is used, it is called Kasseropita. 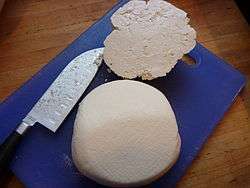 Also, several pitas found all over Greece, such as Kolokythopita, Mizithropita (Crete), Melintzanopita, Tsouknidopita, Kremydopita, Kreatopita (meat pie), Galatopita, Marathopita, Malathropita (Chios), Ladopita. 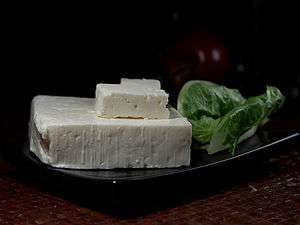 Kolokythoanthoi are often served with a dollop of Greek yogurt on the side. Fakes, a lentil soup, usually served with vinegar and olive oil. Fasolada, a white-bean soup defined in many cookery books as the traditional Greek dish, sometimes even called "the national food of the Greeks". It is made of beans, tomatoes, carrot and a generous amount of celery usually served with a variety of salty side dishes(like olives or anchovies). Kremydosoupa, onion soup served with vinegar. Magiritsa, the traditional Easter soup made with lamb offal, lamb liver, lamb lung and sometimes mutton meat usually thickened with avgolemono. Psarosoupa 'fish soup' can be made with a variety of fish (usually kokkinopsaro) and several kinds of vegetables (carrots, parsley, celery, potatoes, onion), several varieties include the classic kakavia which is drizzled with olive oil. Trahana soup, made from a dried grain-dairy substance and chicken fat. Anginares a la Polita:artichokes Constantinople style with artichoke hearts, olive oil, potatoes, carrots dill. Arakas me anginares: oven-baked fresh peas with artichokes. Bamies: okra with tomato sauce (sometimes with potatoes or during non-fasting times with chicken/lamb). Briám: an oven-baked ratatouille of summer vegetables based on sliced potatoes and zucchini in olive oil. Usually includes eggplant, tomatoes, onions, and ample aromatic herbs and seasonings. Fasolakia: fresh green beans stewed with potatoes, zucchini and tomato sauce. Gemista, baked stuffed vegetables. 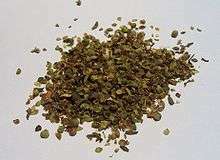 Usually tomatoes, peppers, or other vegetables hollowed out and baked with a rice-and-herb filling or minced meat. Gigandes plaki: large lima beans baked with tomato sauce and various herbs. Often made spicy with various peppers. Horta (greens), already mentioned in the appetizers section, are quite often consumed as a light main meal, with boiled potatoes and bread. Kinteata, dish made from boiled young nettles. Spanakorizo, spinach and rice stew cooked in lemon and olive-oil sauce. Tomatokeftedes: tomato fritters with mint, fried in olive oil and typically served with fava (split-pea puree). Mainly a Cycladic island dish. Apáki: Cretan specialty; lean pork marinated in vinegar, then smoked with aromatic herbs and shrubs, and packed in salt. Bifteki: Ground beef burgers either baked, fried or grilled. Chtapodi sti schara: grilled octopus in vinegar, oil and oregano. Accompanied by ouzo. Giouvetsi: lamb or veal baked in a clay pot with kritharaki (orzo) and tomatoes. Gyros: meat (usually pork) roasted on a vertically turning spit and served with sauce (often tzatziki) and garnishes (tomato, onions) on pita bread, or served as a sandwich wrapped in pita bread together with tomatoes, onions, tzatziki and tomato sauce; a popular fast food. Kalamari: squid, most often fried. Kleftiko: literally meaning "in the style of the Klephts", this is lamb slow-baked on the bone, first marinated in garlic and lemon juice, originally cooked in a pit oven. It is said that the Klephts, bandits of the countryside who did not have flocks of their own, would steal lambs or goats and cook the meat in a sealed pit to avoid the smoke being seen. Kokoretsi, Lamb or goat intestines wrapped around seasoned offal, including sweetbreads, hearts, lungs, or kidneys, and spit-roasted. Moussaka (from Arabic مسقعة musaqqa'): an oven-baked layer dish: ground meat and eggplant casserole, topped with a savory custard which is then browned in the oven. There are other variations besides eggplant, such as zucchini or rice, but the eggplant version, melitzánes moussaká is by far the most popular. The papoutsákia ("little shoes") variant is essentially the same dish, with the meat and custard layered inside hollowed, sauteéd eggplants. Oven-baked lamb with potatoes (Αρνί στο φούρνο με πατάτες, Arní sto foúrna me patátes). One of the most common "Sunday" dishes. 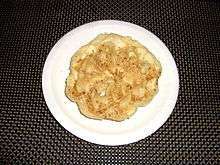 There are many variations with additional ingredients. Oven-baked chicken with potatoes (Κοτόπουλο στο φούρνο με πατάτες ''Kotópoulo sto foúrna me patátes). Another common "Sunday" dish. Paidakia: grilled lamb chops with lemon, oregano, salt and pepper. 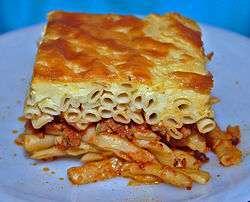 Pastitsio: an oven-baked layer dish: Béchamel sauce top, then pasta in the middle and ground meat cooked with tomato sauce at the bottom. Pork with celery (hirino me selino/hirino selinato). Savridia: mackerels oven-baked or fried. Soutzoukakia Smyrneika (Smyrna meatballs): long shaped meatballs with cumin, cinnamon and garlic and boiled in tomato sauce with whole olives. Often served with rice or mashed potatoes. Souvlaki: (lit: "skewer") grilled small pieces of meat (usually pork but also chicken or lamb) served on the skewer for eating out of hand, or served as a sandwich wrapped in pita bread together with tomatoes, onions, tzatziki and tomato sauce; a popular fast food, also called kalamaki (small reed) mainly in Athens. Spetsofai: a stew of country sausage, green mild peppers, onions and wine. Originates from Pelion. Stifado: rabbit or hare stew with pearl onions, vinegar, red wine and cinnamon. Beef can be substituted for game. Yiouvarlakia: meatballs soup with egg-lemon sauce. 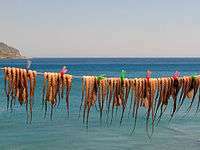 Octopuses are often sun-dried before grilling. Meals easily available with inexpensive ingredients and little preparation involved. Hilopites pasta with chicken: savory chicken is mixed with "Hilopites" or cut up tile-shaped pasta in a spiced tomato sauce. Strapatsada: eggs scrambled in olive oil and fresh tomato puree, seasoned with salt, pepper and oregano. Often includes feta cheese. Diples are made on an iron mould dipped in batter and cooked in oil. Amygdalotá or pastéli exist in many varieties throughout Greece and Cyprus, and are especially popular in the islands. They consist of powdered blanched almonds, confectioner's sugar and rose water, molded in various shapes and sizes. They are snow-white and are considered wedding and baptismal desserts. Baklava, phyllo pastry layers filled with nuts and drenched in honey. Diples, a Christmas and wedding delicacy, made of paper-thin, sheet-like dough which is cut in large squares and dipped in a swirling fashion in a pot of hot olive oil for a few seconds. As the dough fries, it stiffens into a helical tube; it is then removed immediately and sprinkled with honey and crushed walnuts. Finikia, cookie topped with chopped nuts. Galaktoboureko, custard baked between layers of phyllo, and then soaked with lemon-scented honey syrup. The name derives from the Greek "gala"(γάλα), meaning milk, and börek, meaning filled, thus meaning "filled with milk". Karydopita, a cake of crushed walnuts, soaked in syrup. 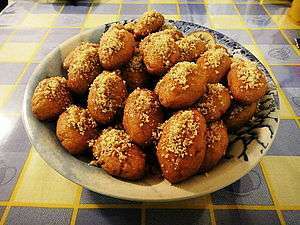 Koulourakia, butter or olive-oil cookies. Kourabiedes, Christmas cookies made by kneading flour, butter and crushed roasted almonds, then generously dusted with powdered sugar. Loukoumades, similar to small crusty donuts, loukoumades are essentially fried balls of dough drenched in honey and sprinkled with cinnamon, typically served with sesame seed. Loukoumi is a confection made from starch and sugar. Patrina loukoumia are famously produced in the city of Patras. A variation from Serres is called Akanés. 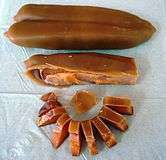 Loukoúmia are flavored with various fruit flavors, with rose water considered the most prized. Melomakarona, "honey macaroons", Christmas cookies soaked with a syrup of diluted honey (méli in Greek) and then sprinkled with crushed walnuts. Milopita, apple pie with cinnamon and powdered sugar. Moustalevria, a flour and grape must flan. Moustokouloura, cookies of flour kneaded with fresh grape juice (must) instead of water. Rizogalo ("rice-milk") is rice pudding. Spoon sweets (γλυκά του κουταλιού) of various fruits, ripe or unripe, or green unripe nuts. Spoon sweets are essentially marmalade except that the fruit are boiled whole or in large chunks covered in the fruit's made syrup. Tsoureki, a traditional Christmas and Easter sweet bread also known as 'Lambropsomo' (Easter bread), flavored with "mahlepi", the intensely aromatic extract of the stone of the St. Lucie Cherry. Vasilopita, Saint Basil's cake or King's cake, traditional only for New Year's Day. Vasilopites are baked with a coin inside, and whoever gets the coin in their slice are considered blessed with good luck for the whole year. Yogurt with honey and walnuts. There is a variety of non alcoholic beverages that are drunk in Greece even to this day. Portokalada (orangeade) and Lemonada (lemonade), since 1971, these beverages were served everywhere, in homes, cafes, tavernas and restaurants. They were made with fresh strained orange juice or lemon juice either mixed with carbonated water or flat mineral water and you added sugar to taste. There were also bottled local versions. 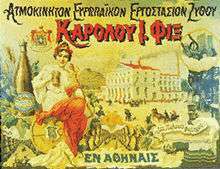 In 1989 on the island of Rhodes there were two companies that made and bottled their own portokalada and lemonada using local oranges, lemons and water. These beverages are still standards today, as of 2014, the difference being that most of the small local companies sold their businesses to the big companies like Fanta etc., thus, greatly changing the quality. Visinada (cherryade) is made from dark cherry syrup (which was originally homemade) mixed with cold water. 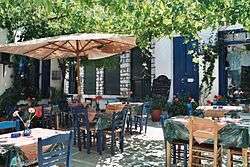 The traditional coffeehouses in Greece are called kafenia, and they offer coffee, refreshments, alcoholic beverages and snacks or meze. In recent years, especially in the large urban centres, kafenia are gradually being replaced by modern "cafeterias". Preferred types of coffee are, among others, Greek coffee, frappé (a foam-covered iced coffee drink), and iced cappuccino and espresso, named Freddo Cappuccino and Freddo Espresso, respectively. 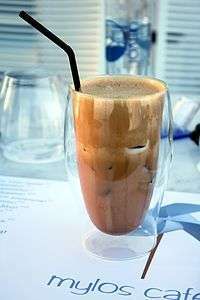 Iced coffee-based drinks, such as freddoccino or freddito, are also popular in the summer. For more details on this topic, see Greek wine. The origins of wine-making in Greece go back 6,500 years and evidence suggesting wine production confirm that Greece is home to the oldest known grape wine remnants discovered in the world and the world’s earliest evidence of crushed grapes. The spread of Greek civilization and their worship of Dionysus, the god of wine, spread Dionysian cults throughout the Mediterranean areas during the period of 1600 BC to the year 1 AD. Greece's viticultural history goes back to prehistoric times,i[›] and wine production was thriving until the 11th century. After World War II, Greek winemakers imported and cultivated foreign grape varieties, especially French ones, in order to support local production. In 1960s, retsina, a dry white wine with lumps of resin, was probably the most well-known Greek wine abroad. In recent years, local varieties are rediscovered and often blended with foreign ones. In early 1980s, a system of appellations, modelled on the respective French one, was implemented to assure consumers the origins of their wine purchases. Today, there are 28 appellations (Appellations of Origin of Superior Quality and Controlled Appellation of Origin) throughout the country, from Macedonia to Crete. Archaeological and archaeochemical finds suggest that the Minoans fermented barley and other substances, and consumed some form of beer. The beer tradition of the Minoans was discontinued by the Mycenaeans; beverages from fermented cereals may have remained only in Crete during their rule. In Archaic and Classical Greece, beer is mentioned as a foreign beverage, while, when Alexander the Great conquered in 332 BC Egypt, a civilization with a long brewing tradition, the Greeks continued to disdain beer seeing it as the drink of their rivals. 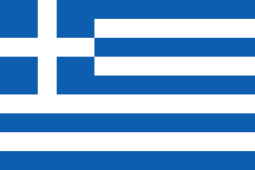 In Modern Greece, a limited number of brands—owned by breweries from northern Europe in most cases (e.g. Heineken or Amstel)—dominated for many years the local market, while a stringent Bavarian-influenced beer purity law was in force. Gradually, the provisions of this law loosened, and, since the late 1990s, new local brands emerged (in 1997 Mythos made a breakthrough) or re-emerged (e.g. Fix Hellas), reviving competition. In recent years, in parallel with the large breweries, local microbreweries operate throughout Greece. Greek alcoholic beverages: Tentura (left) and Mastika (right). Other traditional Greek alcoholic beverages include the anise-flavored ouzo, tsipouro (whose Cretan variation is called tsikoudia), and local liquors, such as mastika (not to be confused with the homonymous anise-flavored Bulgarian drink), kitron, a citrus flavoured liquor from Naxos and tentura, a cinnamon flavored liquor from Patras. Metaxa is a well-known brand of brandy blended with wine and flavorings. Local dessert and fortified wines include muscats (with the Muscat of Samos being the most well-known), mavrodafni, produced from a black grape indigenous to the Achaea region in Northern Peloponnese, and Vin Santo of Santorini, a variation of the Italian Vin Santo. ^ i: Discoveries, such as a wine press at Palekastro in Crete, dated to the Mycenaean period, and references related to wine in Linear B tablets indicate that, at this period, wine was widely produced and consumed both on the Greek mainland and in the islands. ↑ Katz, Solomon H.; McGovern, Patrick; Fleming, Stuart James (2000). Origins and Ancient History of Wine (Food and Nutrition in History and Anthropology). New York: Routledge. p. x. ISBN 90-5699-552-9. ↑ Wilson, Nigel Guy (2006). Encyclopedia of ancient Greece. New York: Routledge. p. 27. ISBN 0-415-97334-1. ↑ Civitello, Linda (2007). Cuisine and Culture: A History of Food and People. New York: Wiley. p. 67. ISBN 0-471-74172-8. ↑ Kiple, Kenneth F. (2007). A movable feast: ten millennia of food globalization. Cambridge, UK: Cambridge University Press. p. 95. ISBN 0-521-79353-X. ↑ Τονια Τσακιρη. "Η Goody's νίκησε στον πόλεμο με τη McDonald's - οικονομικές ειδήσεις της ημέρας - Το Βήμα Online". Tovima.gr. Retrieved 4 May 2014. ↑ "When And How Greeks Eat". Ultimate Guide to Greek Food. Retrieved 11 June 2016. 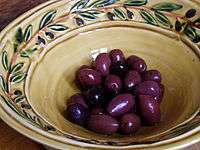 ↑ "Gigantes/Yiyantes (Greek Giant Baked Beans)". Thursdayfordinner.com. 16 November 2008. Retrieved 4 May 2014. ↑ Walsh, Robb (2015). The Chili Cookbook. Berkeley CA: Ten Speed Press. ISBN 1607747952. ↑ "Diples (Thiples) (Honey Rolls) Greek Dessert". Thursdayfordinner.com. 28 December 2008. Retrieved 4 May 2014. 1 2 6,500-year-old Mashed Grapes Found in Greece. Discovery News (16 March 2007). ↑ Jacobson, Jean L. (2006). "Berry to Bottle". Introduction to Wine Laboratory Practices and Procedures. Springer. p. 84. doi:10.1007/0-387-25120-0_4. ISBN 978-0-387-24377-1. * "Appellation Wined of Greece" (in Greek). 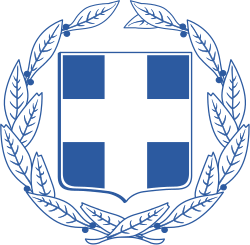 Greek Wine Federation. Retrieved 25 December 2011. Dalby, Andrew (1996). Siren Feasts: A History of Food and Gastronomy in Greece. London: Routledge. ISBN 0-415-11620-1. Oliver, Garrett, ed. (2012). The Oxford Companion to Beer. Oxford University Press. ISBN 0-19-536713-8. Halevy, Alon Y. (2011). The Infinite Emotion of Coffee. Macchiatone Communications. ISBN 0-9847715-1-4. Karayanis, Dean; Karayanis, Catherine (2008). Regional Greek Cooking. Hippocrene Books. ISBN 0-7818-1146-5. Kousoulas, Kostas (2001). "Naousa and its Wines" (PDF). Niaousta (in Greek). 94: 32–35. Retrieved 26 December 2011. Nelson, Max (2005). The Barbarian's Beverage. Routledge. ISBN 1-134-38672-9. Unwin, Tim (1996). Wine and the Vine. Routledge. ISBN 0-203-01326-3. Walton, Stuart; Glover, Brian (2011). The Illustrated Encyclopedia of Wine, Beer & Spirits. London: Hermes House. Wikimedia Commons has media related to Greek cuisine.